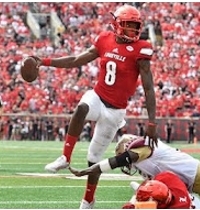 Louisville, coming off its impressive win over Florida State, will face Conference USA foe Marshall Saturday at Joan C. Edwards Stadium in Huntington, W.Va. (8 pm, CBSSN)...The Cardinals are coached by Bobby Petrino and led by QB Lamar Jackson...Marshall is coached by former NC State assistant Doc Holliday. Saturday’s game will be Louisville’s first trip to Huntington since 1977. In the first three weeks of the season alone, Jackson has set ACC records for total offense in a single game (610), and most TDR in a half (8), a game (8), two games (13) and three games (18). Of note: The Cardinals seek to get back on the winning track in their series with the Thundering Herd, which has won the last four meetings ... The teams most recently met in 2011 at Louisville, which Marshall coming out on the front end of a 17-13 score under then second-year head coach Doc Holliday, a former NC State assistant ... Louisville’s last win at Marshall came by a 56-0 score in 1977, and the Cardinals will be seeking their fi rst over the Herd at any site since 1981.